Sustained job growth, affordable home prices, low mortgage rates and a rebound in consumer, small business and builder confidence will help the housing market continue to show modest improvement and better production levels in the months ahead, according to NAHB Chief Economist David Crowe. Watch this video to get the full forecast. An important reason why the economy has not recovered from the Great Recession as quickly as in prior economic downturns is that a traditional leader of economic growth – housing – has been stifled. In recent months however, housing has returned to contributing to economic growth, with home building alone responsible for 20 percent of GDP growth in the last six quarters. And when it comes to job growth and housing, it is often the change in payroll employment for home builders and residential contractors that attracts the most attention. As of April 2013, total home building employment (builders and contractors) stood at about 2.1 million according to the Labor Department, growing off of cycle lows. And just over the last year such employment is up almost 100,000 jobs. While building employment is substantial, there is a significant amount of other housing-related employment, whether connected to building, furnishing a house, or other housing needs. For example, there are firms – recognized as “associate members” in local home builder associations – who enable builders to build, providing a bevy of products and services, including lumber sales, windows, appliances or financial services. These firms tend to be small businesses spread out across the country. And of course, these beneficial economic impacts are not limited to building. As the chart above indicates, accounting for housing related retail sales, finance, leasing, property management, service provision and even furniture and housing appliance manufacturing and logging adds more than 2.7 million jobs to the housing employment base of approximately 5 million. 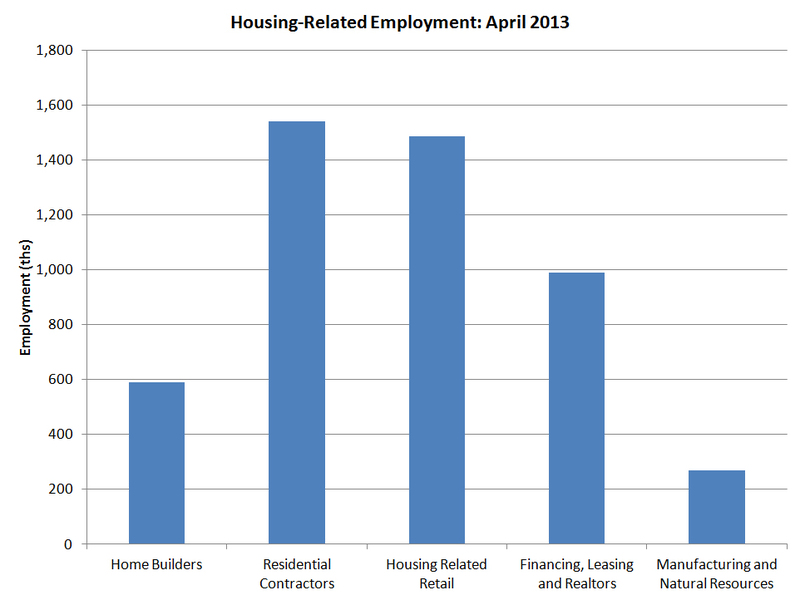 As housing markets continue improving across the nation, these sectors are set for job growth. As home sales increase, housing-related spending will increase. Prior research indicates that the typical buyer of a newly built home will spend $7,400 more than a non-moving household in the first two years after purchase of the residence on furniture, household furnishing, remodeling and appliances. Similarly, a typical buyer of an existing home will spend $4,000 more. Given the considerable amount of pent-up housing demand, particularly among younger Americans, the ever-improving housing market should continues its role as a provider of a virtuous circle. Growing housing demand creates jobs across a wide array of sectors and regions, which in turn unlocks additional housing demand.